In the word, ‘Kadampa’, ‘Ka’ refers to Buddha’s teachings, and ‘dam’ to Atisha’s special Lamrim instructions. Kadampas, then, are practitioners who regard Buddha’s teachings as personal instructions and put them into practice by following the instructions of Lamrim. The stages of the path to enlightenment, or Lamrim in Tibetan, is the backbone ofKadampa Buddhism. Lamrim is a special set of instructions that includes all the essential teachings of Buddha Shakyamuni arranged in such a way that all his Hinayana and Mahayana teachings can be put into practice in a single meditation session. There are 1200 Kadampa centres. See the Kadampa Worldwide annual brochure for all events happening all around the world. Founder of the New Kadampa Tradition, Geshe-la has established more than 1200 centers and groups around the world, trained hundreds of qualified Teachers and a flourishing ordained community, and created a project to build Buddhist Temples in every major city in the world. In his teachings Geshe Kelsang emphasizes the importance of meditation and how to apply it in daily life, the need to be truly happy, and how to cultivate a good heart to help others — and he demonstrates these qualities perfectly in his own life. He is a humble Buddhist monk dedicated to helping people throughout the world find true happiness in their hearts. Gen-la Kelsang Dekyong is the Spiritual Director of the NKT and the Resident Teacher at Manjushri KMC, the Mother Center of Kadampa Buddhism. Gen-la is a modern buddhist nun who is dedicating her entire life helping people of all faiths to attain permanent happiness through developing their inner peace. Gen-la has studied and practiced Kadampa Buddhism for over 30 years under the guidance of Venerable Geshe Kelsang Gyatso. She inspires students around the world through her example of relying upon a spiritual guide and through taking to heart and practicing the teachings of Buddha in her daily life. 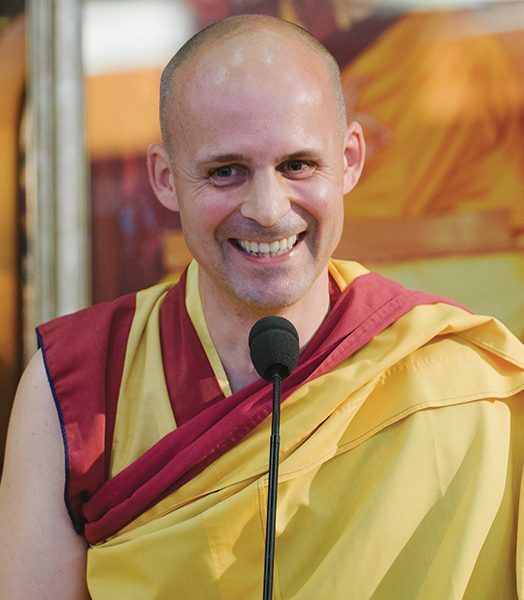 Gen-la Jampa is an internationally renowned Buddhist ordained teacher and the Deputy Spiritual Director of the New Kadampa Tradition – International Kadampa Buddhist Union (NKT-IKBU). As a senior teacher of the NKT, Gen-la Jampa has been a student of Venerable Geshe Kelsang Gyatso for many years and under his guidance has taught at many centers and events internationally. Gen-la is well-loved for his clear and inspiring teachings, and his ability to touch people’s hearts through his sincerity and loving-kindness. Venerable Geshe Kelsang Gyatso Rinpoche requested him to become the Resident Teacher of IKRC Grand Canyon and we are very fortunate that he accepted. Gen-la Kelsang Khyenrab is the National Spiritual Director in Canada and the Resident Teacher at KMC Canada in Toronto. Gen-la has been studying and teaching Kadampa Buddhism under the guidance of Venerable Geshe Kelsang Gyatso for many years. His profound and powerful teachings are appreciated throughout the world and his example shows his own experience of Dharma. Geshe Kelsang’s compassionate intention is embodied in the International Temples Project (ITP), a unique international fund dedicated to public benefit. It was founded by Venerable Geshe Kelsang Gyatso with the aim to introduce the Buddhist faith and practice of the New Kadampa Tradition publicly, and to show how individuals and society benefit through the practice of Buddhism in modern day life. Constantly adapting to meet the needs of modern society, the International Temples Project presently achieves its aim through creating and supporting traditional and non-traditional World Peace Temples, meditation centres and retreat centres, and through the activities of Kadampa Schools, World Peace Cafes, and Tharpa Publications. The events vary in length from two days to two weeks, but whatever their duration they all offer a vacation with a difference – a chance to break free from the hectic routines of daily life and focus on the things that really matter. You will come away not only refreshed and relaxed but also spiritually reenergized. Kadampa Meditation Centre Canada is the mother centre of the NKT-IKBU in Canada. Located in downtown Toronto, it welcomes hundreds of visitors each year and hundreds of kadampa pratitioners for the Canadian Dharma Festival each summer. Visit their website here. Kadampa Meditation Centre Montréal is the mother centre of the NKT-IKBU in Québec. You are currently visiting this website!